Ochai was ranked like 350 before committing to KU. Guys that never saw him all of a sudden ranked him inside 200. MITCH CAN'T HELP DAT DOOD CAN'T JUMP!! KU 0 for its last 5, with a few of those misses coming with the Jayhawks up 10. #KUbball remains up 53-45. Even though Kansas is 5 for 17 in 2nd half. Dotson should get that assist. Jason Witten shown on the big screen during this timeout... That and "Snackwards" really got the people going. #KUbball leads 61-52 with 7:50 to play. Jayhawks have been terrific this half. Not flawless, but tough and efficient. Let's see if they can finish. The best thing TCU has to show off is a giant Jamie Dixon? That's 19 points now for Dotson. His career-high is 20. #KUbball leads 63-52 with 6:30 to play. 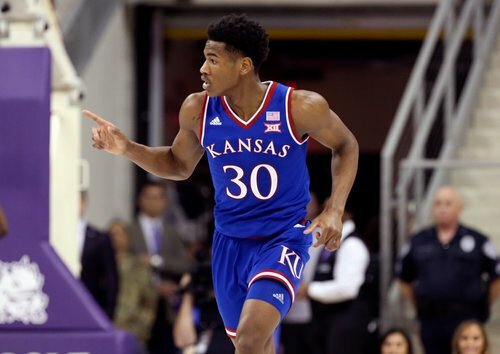 Is there an argument that Ochai Agbaji should at least be 2nd team all Big 12? Ochai just refusing to get his 10th rebound. He doesn't want to show off and make it all about him. I get it. I agree - if he keeps up the same numbers he has to be considered. #KUbball imploding a little bit right now... Turnovers, missed shots, missed FTs and now Dedric Lawson with his 4th foul. KU leads 63-56 with 5:09 to play, but this one is tightening up. Fran - BEING MITCH LIGHTFOOT IS AWESOME EVERY SINGLE DAY!! Huge moment for KU as Grimes' shot rims out and Lightfoot crashes in for the putback. #KUbball up 65-56 with 4:51 to play. Samuel had just missed 2 FTs. 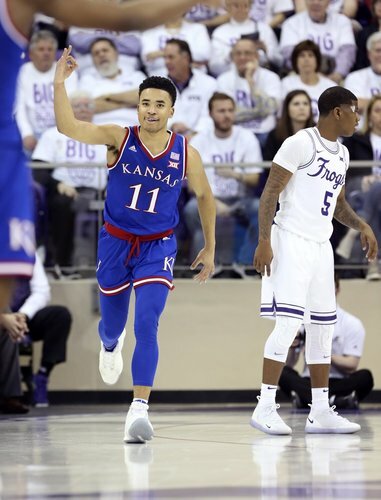 Lightfoot with a HUGE folo dunk calms things down for #KUbball and there are a few TCU fans starting to file toward the exits. Weird. 65-56, Kansas with 4:51 to play.